Well, the word is out! Obama wants $1.5 trillion in new tax increases. Of course, this will only affect the rich and corporations … you know. Except that … corporations do not pay taxes. They pass the additional cost of doing business on to the consumer. Ummm! For you highly intelligent progressive-liberal types … that’s you and me! It is good, however, to hear the rich are finally going to pay their fair share … since they already pay something like 90% federal income tax revenues already. Of course that may cut down on the ability of lots of small businesses to hire new employees … but that’s ok too … since Obama is going to just have us all work for the government. That might need still more taxes … to pay everyone … but you know …. fair is fair! Wouldn’t Jimmy Carter be proud!! We would probably not need to raise taxes! Canada is creating more jobs for Americans than Obama is! How are they doing that … drilling for oil! Hmmmm! And … we still are not! Why? It seems that Obama did his part to support the Canadian job market. The two buses he bought for his recent tax-payer financed luxury bus tour were made in Canada. The Prevost buses coast $1.1 million each and are the company’s top of the line luxury models … like those used by major traveling rock bands. It is good to see Obama getting the finest in Canadian exports … while 14 million Americans are unemployed. I am sure the higher taxes will help! Previous PostObama And His Minions Just Simply Do Not Get It!Next PostChicago Tribune Tells Obama: Do Not Run! Gotta love your attributions all other wingbot blogs. Now there’s a source for the “truth”. I don’t give a s**t what you think about Obama, but all I want to know is what you have against American manufacturing? For those $1.1M buses the secret service bought from the Nashville coach builder, at the very most $350K goes to Canadian companies. The shell from Prevost costs about $450K so right away the other $650 goes to the Nashville company. Then if you look at whats in the shell. Engine, transmission, driveline, suspension, braking systems. Most of its sourced from American companies like Detroit Diesel and Allison. So what do you have against American manufacturing to call a mostly American bus Canadian? The referenced articles are not my sources. They are simply a means to generate reciprocal traffic and interest. I have nothing against American manufacturing at all. I would like to see much more of it. Would you call a mostly South Korean, German, British, or Japanese car assembled at plants in U.S. American? It is a silly argument. Toyota, Nissan, Hyundai, BMW, Landrover, and Kia (among others … ) are putting a lot of Americans to work. My point is that Canada is creating more jobs for Americans (via oil exploration and drilling, and yes … even selling Obama luxury buses; than Obama’s economic and “job creation” policies are! And … that we did not need to spend $2.2 million of the tax payers dollars on two new top of the line, rock-star quality touring buses (not to mention all the money for the security upgrades and armor plating) for what amounted to a three-day Obama campaign tour; especially right now when we a borrowing 40 cents of every dollar Obama spends from the Chinese. If you think that Obama’s purchase of those buses for $1.1 million each, at this point in time, for the amount of money, for the time he actually spent riding in them; was a good and proper use of tax payer’s dollars … then, my friend, you are part of the problem. Man I’d love to be a car dealer in your town since you apparently you think you need to buy a new vehicle every time you go on a trip. And the fact that the secret service said it would be more cost effective then renting and retrofitting buses and then removing all their mods when their done, tells me you are pissed that they will be spending less money in the long run. Good little wingbot. Never let the facts or truth get in the way of a good fabrication. I thought the left wing bots were bad during the Bush admin. But you right wing bots make the left wing bots look like amateurs. Hmmm! 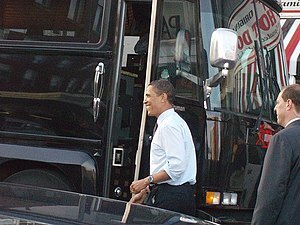 Obama uses those 2 buses that cost U.S. taxpayers about $2.2 million for a few hours and you are saying that this was more cost effective than renting them? Well, that is about what I expect! I suppose that, being so budget-minded, you and your family all take separate flights when you go on vacation as well? I mean, it takes a little effort to coordinate schedules after all. That is just so much to expect in tough ecenomic times. That money should never have been spent at all! It was nothing more than a campaign bus tour at taxpayer expense. You do demonstrate the left-wing penchant for name calling quite well though! Congrats! Yep, that’s what the secret service said. Over the expected 10 year service life (do you understand service life?) of the vehicles they expect it to be more cost effective. So they think it will be cheaper in the long run then renting, building out and then reverting the buses when they’re done with them. Whether it was a campaign bus tour or a government function, the secret service is obligated to provide security for the president and within 90 days of the election any legitimate candidate. They don’t get to decide which details to provide security on. You have demonstrated that you are a true wingbot. Your reaction is the same as many left wingbots when I point out lies on their sites. Your canned response is I’m from the “other side”. But, whether on the left or on the right, wingbots have a couple of things in common. They’re intellectually lazy and lacking personal integrity. You have demonstrated a total lack of comprehension in reading. You must be one of those “whole english” students that missed out on real reading classes; after schools became more about enabling than educating! I am so sorry for you. Having been in the military during the Carter years, I understand all about the Secret Service having to doing its job despite bad choices being made by an administration. But … that has nothing to do with the original point … a government administration that is wastefully spending hard -working tax payer’s dollars like there is no tomorrow. While you sort of make some meandereing points, they have little to do with the original thrust of the post, and like others of your ilk … you then resort to name calling and personal attacks. My “canned response,” if you so choose to call it that, is that out-of-control wasteful spending must stop and fiscal responsibility must be restored at the federal level. If you cannot understand that, then you are not as smart as you seem to think you are. Future comments by you will not be approved … so do not waste your time.